The records were acquired by Clifford Gordon Kent from an unknown source. He may have acquired them through a family connection as one Samuel Dockrill Kent served as a school trustee and as secretary to the trustees from 1927 to 1935. Clifford Gordon Kent would be the grand nephew of Samuel D. Kent as Samuel was the brother of Clifford’s grandfather, William Thomas Kent. 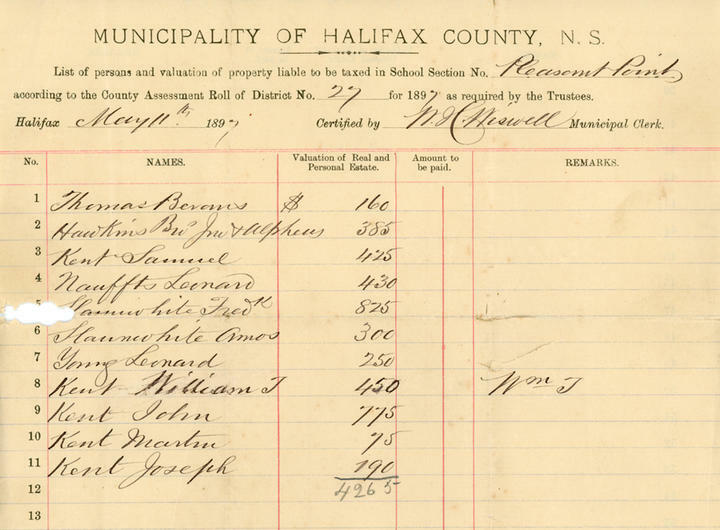 The records likely passed into the possession of Clifford’s son Frederick Clifford Kent following his death in 2001 and were donated to the Eastern Shore Archives by Fred Kent on August 17, 2010. Fonds consists of papers from the Pleasant Point School trustees. They consist of financial records including tax records, memorandums, and receipts as well as meeting minutes, teachers’ agreements, correspondence, and other school related materials. Records were donated by Fred Kent in 2010. 20 folders of textual records.